19th Virginia Infantry, Company B, the Albemarle Rifles. The 19th Virginia, Co. B is a Civil War reenacting group that is dedicated to the preservation of the history of the Civil War and the story of the common soldier during the War. Based on an original unit raised in Albemarle County, Virginia, in April of 1861. we participate in battle reenactments, living histories, encampments, parades, ceremonies, and school programs. We are a family-friendly unit so anyone is able to join! Contact one of our officers today about joining or more information. 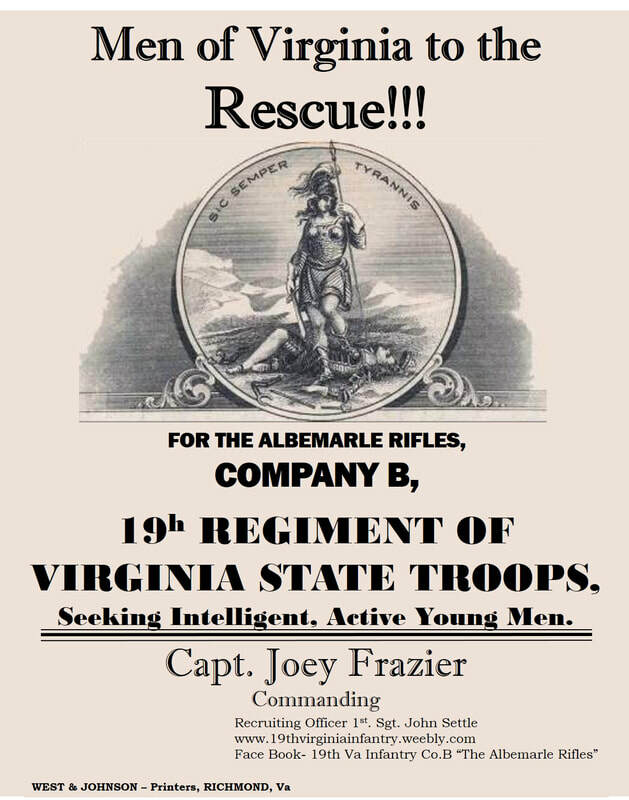 The 19th Virginia Infantry, Company B, "The Albemarle Rifles," is a family oriented group. We do not, nor will ever, associate with any groups of white supremacy or racist views. We welcome anyone to participate in our organization and will not tolerate bigotry.